Just two more updates to go. After two years in Early Access, Oxygen Not Included is getting ready to launch. Klei's survival management romp has two more updates on the docket, and then it will finally hit 1.0 in late May. On April 16, the third quality of life update will fine-tune, polish and scour the game for bugs, and a final update in late May will add three new biomes, along with new creatures, buildings and more. Mod support will also be added. "With that, we feel Oxygen Not Included is ready for a full launch," reads the announcement. "After we've officially launched, we will continue to make quality of life improvements and bug fixes, while the bulk of the team will be moving on to building DLC for the game, where we can explore further ideas and expansions to ONI's world." It's managed to snare 1.5 million players during Early Access, says Klei, and rightly so, as it's been growing into another cracking survival game from the Don't Starve studio. It's still very different from its gothic open-world outing, though. For one, Don't Starve didn't feature nearly as much pee. 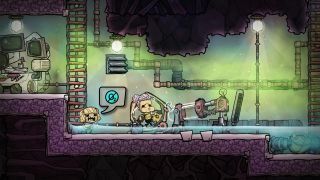 Chris dug it when it he checked it out in 2017—read his Oxygen Not Included impressions—but it's grown considerably since. There are rockets now! And you can raise adorable alien critters. I'm already packing my bags.